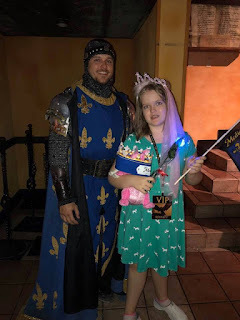 So, a couple of weeks ago Staci and I participated in a scavenger hunt put on by Medieval Times Orlando. Basically, we had to be the first to find the Queen and say a particular phrase. I unbelievably figured out where she was going to be, so off Staci and I went. We wanted to be the first of course, so we were there very early. It was at Kings Dining and Entertainment which turned out to be a bowling alley with restaurant attached up in Orlando. We sat outside, on the porch, sipping a could drink until we saw her car arrive. Up until then I was 99% sure I had the right place. 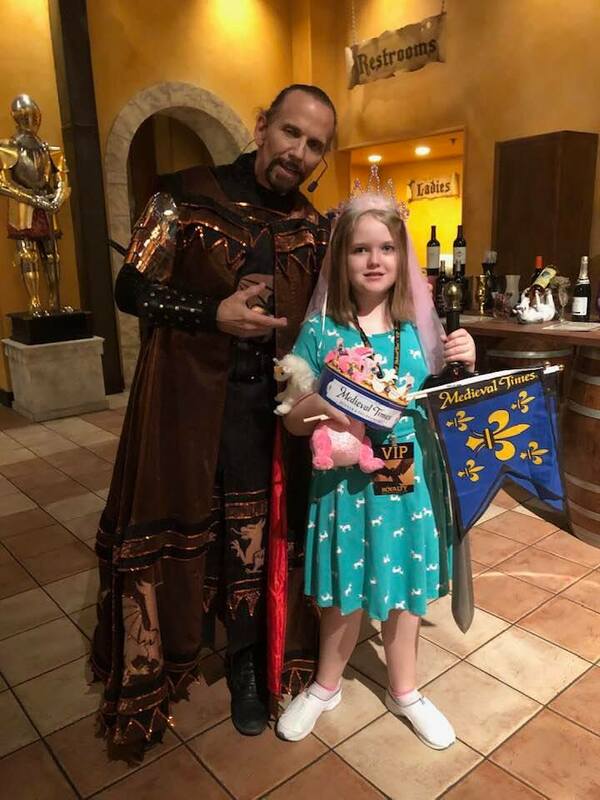 I was so relieved to see I was right since I had made Staci wait patiently all that time LOL She finally got out and Staci was the first to say, “I found you” and give the secret password. 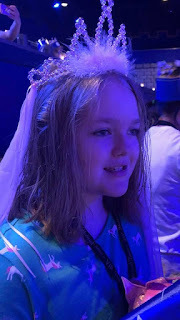 Staci was a little bit awestruck by the Queen in all her finery. 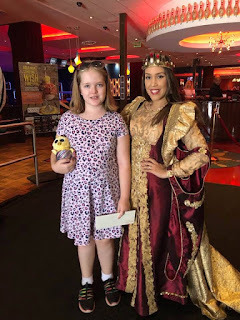 We won tickets to the show at Medieval Times and as an unknown bonus we also won a bowling party from Kings Dining. 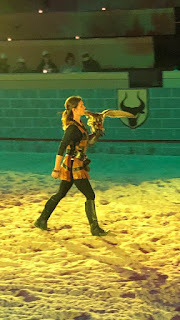 Haven’t used that yet, but we did go to the show at Medieval Times. It was a lot of fun. 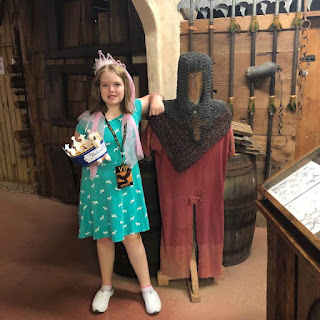 We toured the medieval village, lots of very old stuff there. Signs said some of the items were centuries old. Not really very interesting to look at. It needs to be better displayed. Inside the castle was a gift shop selling souvenirs. We ended up getting a sword for my son, a plush dragon for Staci, a goblet, and a couple of blue knight flags. 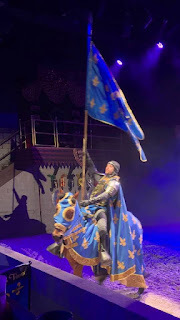 We of course had the Blue Knight as our champion. I had upgraded our seats to VIP so we were in the first row. Nobody in our way to see except our server. They need to time delivery food better. I kept having to dodge them in order to see/get pictures. The food was okay. Staci and I were not big fans of the half a chicken. You do not get silverware, so pulling off meat from a chicken VERY MESSY and not fun. The tomato soup was very delicious though and Staci really enjoyed the garlic bread dipped into it. It was too hot for her to pick the cup up to drink from. The sides were corn on the cob, she stole mine to eat, and a big potato wedge. It was just ok. Only drink choices were water, Pepsi, or sweet tea. Dessert was a cup of vanilla ice cream that had a dollop of caramel on top. They gave us a tiny wooden spoon to eat it with. The texture of the wood though made me feel like I would get a splinter on my tongue, so I did not eat mine. Staci ate half of hers. For the price of the ticket, I would say the meal does not measure up. There needs to be better options, particularly ones geared towards kids. 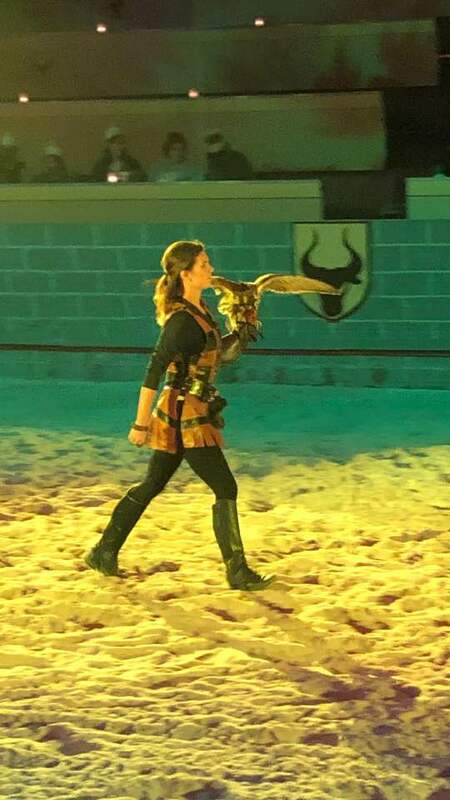 For the show it was fun. 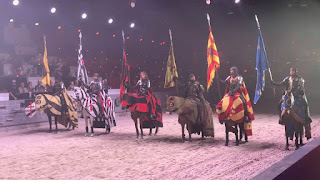 I liked all the knights, some were very handsome LOL Staci enjoyed watching the horses and especially the falcon part. There was supposed to be a story being told, but I honestly have no idea what it was. The way they were speaking was very old world, so it was a challenge to keep up. We gave up and just watched the knights. 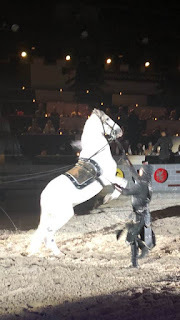 You could tell it was choreographed LOL once the weapons did not fall where they were supposed to, so the knight had to grab it and act like he had been hit. It was hilarious. In between rounds the knights would toss flowers into the stands. Staci was thrilled when out knight tossed her a carnation. She tucked it into her crown. Sadly, the blue knight was not victorious that night. 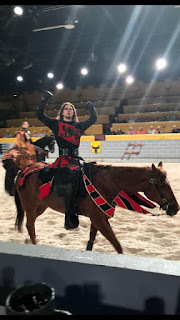 The honor went to the red knight. It was still a lot of fun. I had a sore throat from cheering so loud LOL. Would we do it again? Nope 😊 it was fun, but not for the price.